Last week-end I had a makeover at Laura Mercier with a group of girlfriends. We had a really nice time and were introduced to quite a few very nice products from the range. I will need to give you the details of the subsequent little haul. You would think by now I'd know about everything - well, everything that isn't new - in the beauty market, but this Secret Finish had to be a well-kept one because I had never heard of it. Let me tell you this: it is seriously under-hyped and deserves much more publicity! 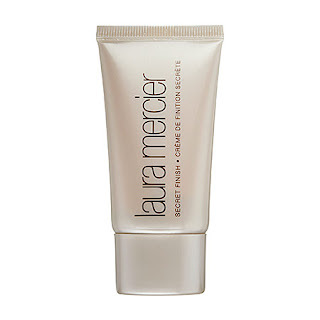 A secret last step that helps set makeup and leaves the skin with a youthful glow. The makeup artist followed the directions that the brands give: you pour a little bit of the cream in the palm of your hands, rub your hands together and pat -not rub- all over the face, paying attention to the undereye area too. It is as simple as that. After a minute, the products sets in and your skin is left glowy and fresh and feeling velvety. This is me having applied the product 7 hours after having put on my makeup. Can you believe how fresh and glowy it looks? Of course you can use the product in the morning immediately after makeup application, for example to get rid of a powdery feel. If you are oily skinned, there is a mattifying version of the product. Aqua (Water), Propylene Glycol, Octyldodecanol, Oryza Sativa (Rice) Starch, Sorbitan Stearate, Hydrolyzed Milk Protein, Hamamelis Virginiana (Witch Hazel) Extract, Olea Europaea (Olive) Leaf Extract, Camellia Oleifera Leaf Extract, Retinyl Palmitate, Tocopherol, Citric Acid, Bisabolol, Disodium EDTA, Phenoxyethanol, Polysorbate 60, Triethanolamine, Carbomer, Methylparaben, Ethylparaben, Butylparaben, Butylene Glycol, Cyclomethicone, Propylparaben, Isobutylparaben, Fragrance, Red 4, Yellow 5. Mariella you just about sold me this product! I don't think I've heard about it either, but dang your makeup looks good after 7 hours! this product is a little miracle, I'm telling you! I have been using this stuff for years. Love it under the eyes as well. Definitely under-rated product that deserves so much more hype.